The elderly citizens of the United States are some of our most vulnerable citizens, and it is important that we do all that is possible to protect them. Family members frequently assume that placing elderly citizens in nursing homes is in their best interest, only to find out about horrific instances of abuse, neglect and exploitation months later. There are ways to prevent your loved one from ever being a victim of this type of behavior by paying attention to the warning signs of abuse, researching a nursing home before enrollment and being in touch with the State Ombudsman Office. Medicare routinely gathers data on the thirty-eight nursing homes in Wyoming based on inspections, surveys and investigations into formally filed complaints involving violations and deficiencies. The federal agency found that nine (24%) of these Wyoming nursing facilities are providing their residents substandard care. 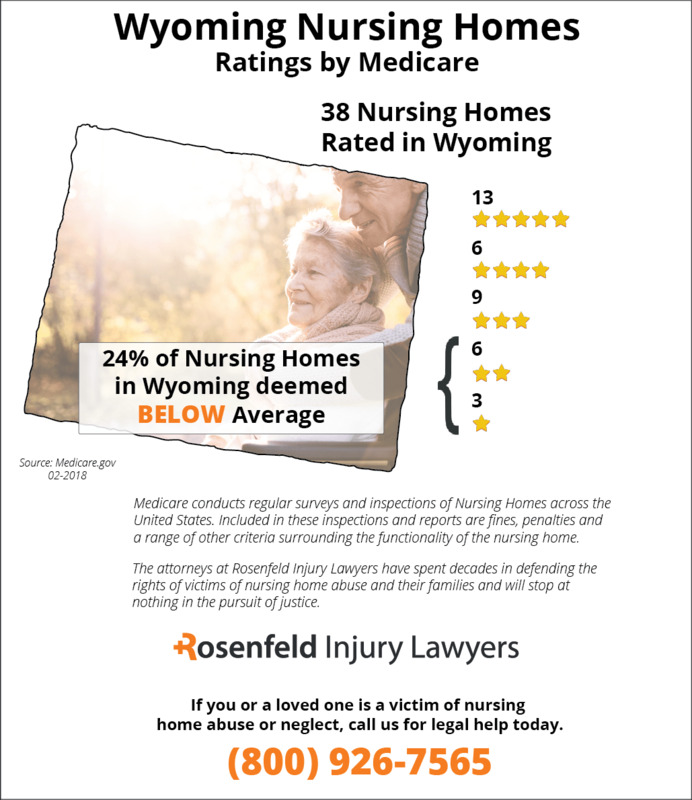 Was your loved one injured, abused, mistreated, or did they die unexpectedly from neglect while living at a Wyoming nursing facility? 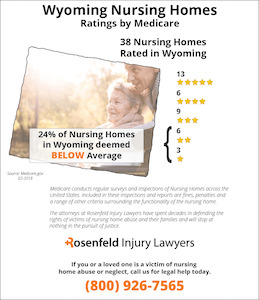 If so, we encourage your family to contact the Wyoming nursing home abuse & neglect lawyers at Nursing Home Law Center today to begin a claim for compensation. We offer every potential client a free case evaluation. In Wyoming, researchers discovered severe deficiencies in nursing homes in 2008. That year, over 53 percent of nursing homes were discovered to have an accident-prone environment. Over 56 percent of nursing homes were discovered to have issues with food sanitation. Over 61 percent of nursing homes had severe problems with maintaining professional standards. One of the worst and most prevalent forms of abuse was indicated by the fact that over 38 percent of nursing homes regularly dispensed unnecessary drugs to nursing home residents. 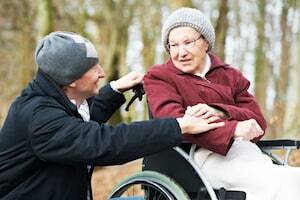 If your loved one has been harmed in a Wyoming nursing home, then it is time for you to assert the rights of your loved one with help from a nursing home neglect law firm in Wyoming. There are numerous federal and state nursing home laws in place to provide protections for a loved one. Unfortunately, the mere existence of these laws is not enough to end the widespread nature of abuse and neglect in Wyoming nursing homes. Administrators seem to think that they can skirt around these laws and continue to hire inadequate staff to carry on with daily operations. Nursing home lawyers will help you to understand the Adult Protective Services and Central Registry of Adult Protection Cases Act. If family members are thinking about filing a lawsuit against a nursing home facility, then they should know that there is only a limited period of time to file a claim. For nursing home negligence claims, there is only a period of two to four years from the date of discovering an injury in which family members may file a claim. 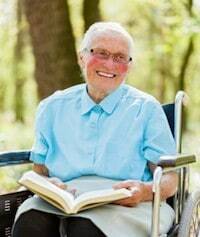 There is no cap on the damages that individuals may receive in nursing home negligence cases. For wrongful death claims, family members only have a period of two years in which to file a legal claim. There is also no cap on the total amount of damages that family members may receive in a wrongful death action. Compensation may be received for the funeral expenses, medical expenses and other injuries that have been suffered by a deceased loved one. Knowing the signs and symptoms of elder abuse can empower family members to take action in protecting loved ones. Typically, there are emotional side effects when one is suffering from physical abuse or being harmed in some other way. You should pay attention to whether a loved one desires to be isolated from friends and family members during visits. This could be a sign that he or she is trying to hide abuse from others. In addition, nursing home residents frequently develop severe anxiety, depression, shyness and other different behaviors when they are being victimized in an abusive situation. They may also try to deny that any abuse or wrongdoing has taken place. Our lawyers are available to meet with family members who have loved ones that have been seriously injured in abusive situations. Call us now for a free initial consultation of your legal claim. If you have a loved one in a nursing facility who is unable to readjust or turn themselves without assistance, they are likely highly susceptible to bedsores. Unfortunately, mobility challenged patients are at great risk to develop an advancing bedsore (pressure ulcer; decubitus ulcers; pressure sore). Without proper protocols, the nursing staff can make the condition worse, where the wound can become vulnerable to a fatal infection. Readjusting the body every two hours or less by turning or repositioning it is the easiest solution to prevent the development of a bedsore. Successful nursing facilities follow strict schedules and guidelines as a part of the patient’s health plan. They ensure that the patient’s weight is adjusted at places where it touches a chair, mattress, pad or cushion. This helps alleviate pressure and allows restricted blood circulation to move fresh oxygen to the skin at the affected area. If the condition is allowed to worsen, it can ulcerate and cause permanent damage or death to the skin and underlying tissue. If the sore progresses to advanced stages, the wound can become vulnerable to sepsis (blood infection) or osteomyelitis (bone infection), causing the condition to become grave. A serious infection places the patient’s life at risk. The rising demand for additional nursing home beds throughout the state of Wyoming has caused an increase for specially trained nurses and nurse’s aides. With the lack of available medical professionals specialized in providing elderly care, nursing facilities are left to hire less competent caregivers that lacks sufficient training. As a result, many patients become the victim of substandard care. Performance skills including a skin assessment during the admittance process to the facility as a way to establish the integrity of their skin. Proper notation on all existing pressure sores to start appropriate treatment to ensure complete healing. Providing healthy nutritious meals and proper hydration each day. Close monitoring of every resident to ensure they stay clean and dry throughout the day. Performance of scheduled routine turnings or readjustments of mobility-challenged patients to alleviate pressure to minimize the potential of developing a sore. Nursing facilities often attempt to persuade families that bedsores are a common occurrence during the aging process. These statements are usually attempts to divert litigation against the facility to avoid lawsuits filed by families angered at the thought that their loved one is suffering needlessly. This is because nearly every type of pressure sore can be avoided when established protocols are followed. Fill out the contact form here to speak with a Wyoming bed sore attorney to stop the neglect today. Your lawyer will take your case on contingency to eliminate the need for paying any upfront fees. The law firm will file a claim on your family’s behalf to demand financial compensation for your losses, damages and injuries. It is crucial to stop the neglect now before the wound is allowed to worsen to a life threatening condition.